Oh Monday, how is it that you always seem to sneak up on us so quickly?! And you brought cold-like symptoms with you this time. Thanks. So while our weekend was fun and relaxing, I felt a little strange the whole time – stuffy nose, itchy eyes and ears, and sneezy. I am really really really hoping this has something to do with allergies (even though it’s never been a problem for me before) because I’m going to New York next week and colds are not welcome! Anyways, I’ve been thinking a lot recently about how to best share some of our more notable weekly meals on the blog. I decided to take some inspiration from Brittany, who shares her weekly meal plan with links to recipes where available. I can’t make any promises that this will be a regular feature (I’m not the best with consistency), but I definitely want to share our quick and easy meals more often. And just for fun, I’ll also be sure to include restaurant meals that were particularly delicious and worth mentioning. I used my microwave method to make the tortillas crispy. Then I spread refried beans (seasoned with cumin, chili powder, salt and pepper) and salsa on top. Next, I topped with cheese and set under the broiler for two minutes. To make the guacamole, I mixed mashed avocado, garlic, tomato, cayenne, lime juice and salt together. The crema was made with equal parts mayo and Greek yogurt, garlic, lime juice, cayenne and salt. DELICIOUS!!! So while I liked this meal, Vishnu was not a fan. However, he did eat some of the leftovers the next day without complaining. Unfortunately, I don’t have a recipe for this. 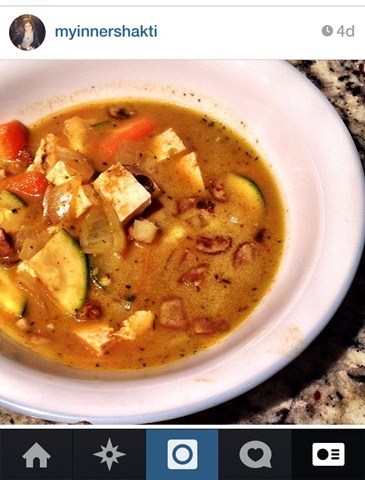 It’s basically a combination of green curry paste, coconut oil, coconut milk, garlic, ginger, soy sauce, tofu and veggies. Not amazing but pretty good! I could eat this everyday. For real. The pasta was the quinoa and brown rice kind from Trader Joe’s. I made the sauce using my spicy sauce recipe. And the eggplant was diced, coated with olive oil, salt and pepper, and roasted in the oven at 400* for 15 minutes. And there was a little cheese…obviously. On Saturday evening, after I was done napping, I asked Vishnu what he wanted to eat. When we couldn’t come up with anything that sounded appetizing to both of us, I suggested going to The Baklava Factory. I bought a Groupon a month or so ago and was waiting for Vishnu’s test to be done so we could try it out. Great choice on my part because the food was amazing! I got the veggie platter (falafel, hummus, baba ganoush, tahini sauce, grape leaves, Greek salad and pita bread), and Vishnu got a kabob platter (3 different kinds of kebabs, rice, baba ganoush, Greek salad and pita bread). YUM! This week I plan to make a couple of Cook Smarts meals, as I signed up for an annual meal plan! You may remember that I was offered a 3 month membership to try out last year. I absolutely loved the service and decided to bring it back into our lives because I think it’ll help with our grocery budget. I’ve been going a little crazy with the food shopping lately. My goal is to create more cohesive weekly meals that build on each other with similar ingredients, and this is where Cook Smarts is perfect. Here’s to staying under budget AND delicious meals! What was the best thing you made/ate last week? *The Cook Smarts links above are referral links. Thank you for reading! Aw, feeling a little yucky is no fun! Hopefully you’re back to normal 🙂 I need to make a tortilla pizza soon. That looks yummy! I’m getting there! 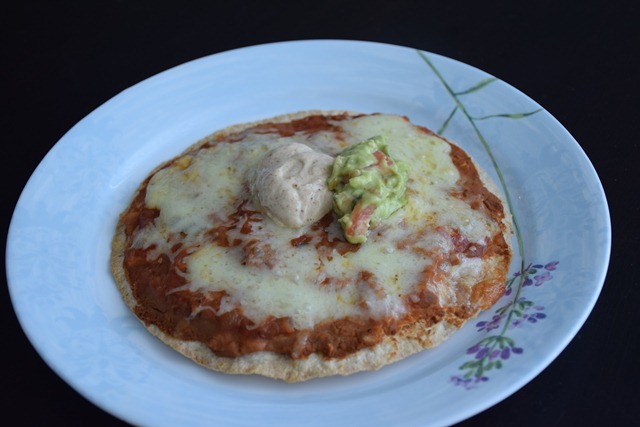 And that Mexican pizza is one of my favorite things…ever! Thank you SO much for linking your spicy sauce- Just checked it out and reckon it’d be an awesome sauce over some chicken thighs! You know, we meant to take some with us but totally forgot. Boo! And let me know if you make the sauce. I know I said you can use balsamic vinegar or red wine but I HIGHLY recommend the wine! Well now all I want to do is shove my face with falafel…thanks girl! Oh man hope you are feeling better, P! 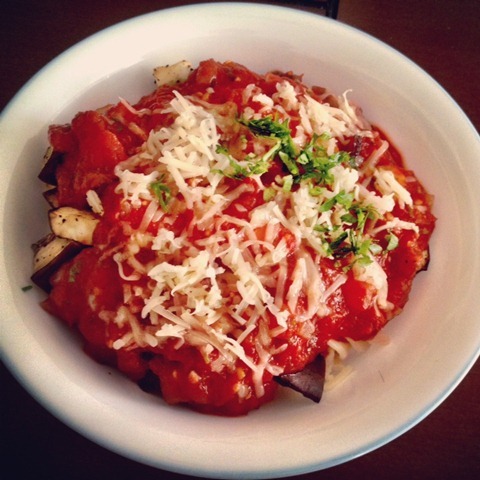 Looks like we were on the same wavelength last week with the pasta- I had a friend over for dinner on Saturday and eggplant pasta with marinara sauce was on the menu…always a winner! The best thing I ate this past week was peanut butter cheesecake…yeah no kidding ;)! UMM…now I want cheesecake – some combo of PB and chocolate would be nice! I am gonna have to disagree with Visnu – your Thai Green Curry has me drooling! The best thing I eat last week were these healthy chocolate scones I made – they were chocolate – need I say any more? P.S. Dark chocolate helps me when I feel a cold coming….just saying…hoping you are feeling better Parita! Shashi @ RunninSrilankan recently posted…Healthy Chocolate Scones! We made spaghetti last week too! Those falafels look amazing! They were delicious! 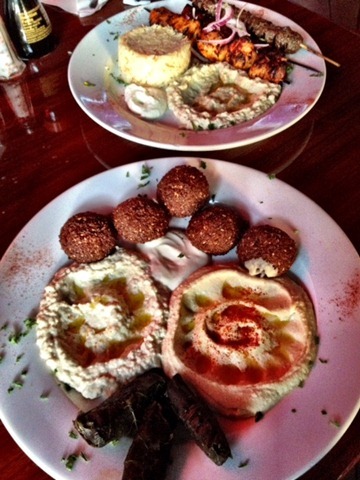 Surprisingly, my favorite was the baba ganoush!